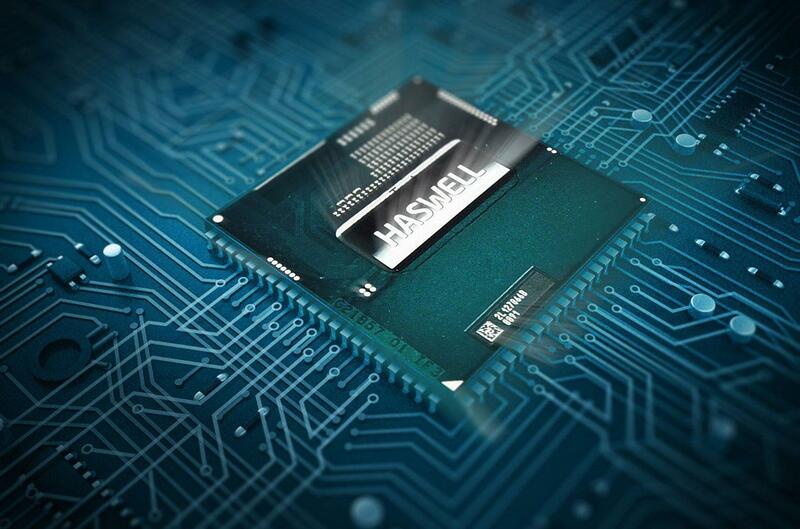 How much has the Intel Haswell HD 4600 really improved integrated graphics? 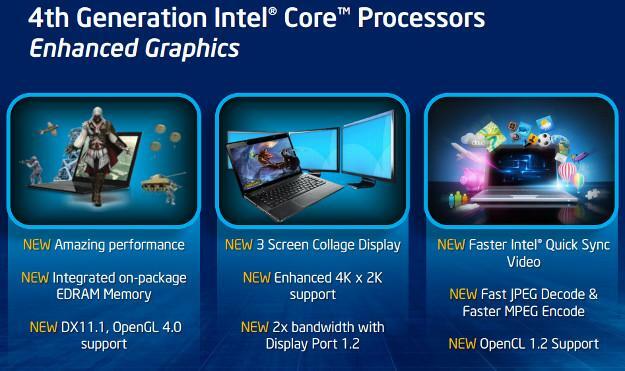 Intel has spent a lot of time talking about its new “Iris” graphics on upcoming Haswell parts, so much so that you could be forgiven for assuming that it would be standard. That, however, is not the case. While Iris and Iris Pro represent the best Intel has to offer, many computers, from desktops to tablets, will have to make do with Intel HD 4600. The information available prior to launch was vague about HD 4600’s capabilities, and what was said did not seem promising, so we were eager to see how the new mid-range integrated graphics processor (IGP) stacks up against Intel’s previous HD 2500 and HD 4000. To test HD 4600, we fired up several games as well as the world’s most demanding benchmarks. When Intel released the first new Core processor architecture, known as Nehalem, it did so alongside a long-term commitment to improve the quality of its integrated graphics processors. This happened with the re-launch of the company’s IGP as Intel HD Graphics, a revision that out-performed previous Intel IGPs by a significant margin. In previous generations, Intel has used a two-prong graphics strategy consisting of a low-end variant barely adequate for even old games, and a high-end variant meant to provide acceptable performance in most titles. During the last generation, these were known as HD 2500 and HD 4000, respectively. The new HD 4600 is essentially a revision of HD 4000, in the same way that Haswell is a revision of the preceding Ivy Bridge. Performance has been improved mainly through a pair of significant changes: an increase in execution units from 16 to 20, and an improvement in clock speed minimum from 350 MHz to 400 MHz. HD 4600, like its predecessor, will automatically overclock itself up to a maximum of 1350 MHz. However, this maximum clock will not be obtainable on certain low-voltage parts, which means not every system with HD 4600 will perform identically. 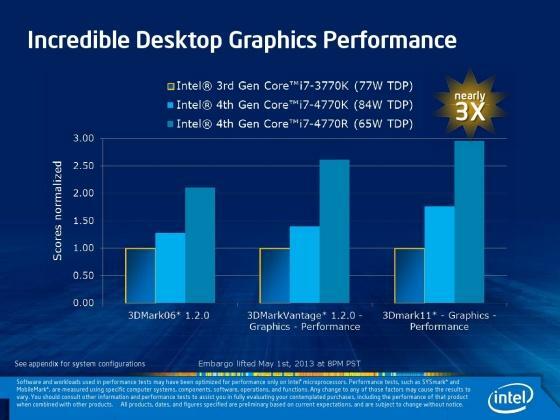 Intel has also used the revision as an opportunity to upgrade compatibility with graphics standards. The new IGP supports Direct X 11.1, as well as Open CL 1.2 and Open GL 4.0. These tweaks are not hugely important in the short-term, but it’s always good for a graphics component to support the latest standards. To test HD graphics we used two older computers in our possession and the Fragbox review unit on loan to us from Falcon Northwest. The specifications of these computers can be found below. All results are rounded. In the case of games, we started our tests from the same save file on each system (thanks, Steam Cloud!) and performed similar actions during each of our three test runs. 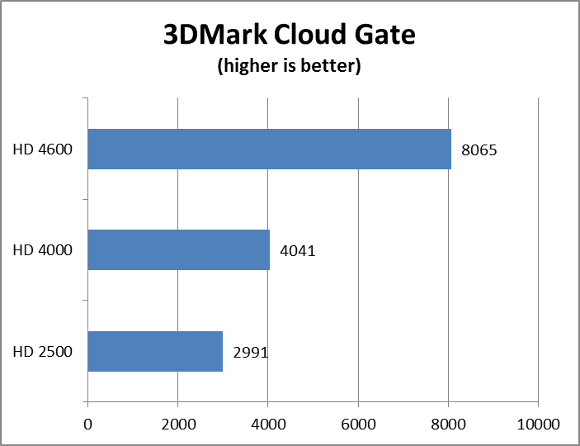 Cloud Gate is the middle-rung test in the new 3DMark suite, and it’s meant to simulate a modestly demanding current-gen game. Intel HD 4000 performs adequately, but the new HD 4600 absolutely annihilates the older part’s score by almost doubling it. This resulted in a very obvious render improvement: Cloud Gate runs great on the new hardware. This demanding benchmark is known for its high image quality and extensive use of tessellation. Though the benchmark still runs poorly on Intel HD 4600, there’s an approximately 50% performance increase. Skyrim is not the latest-and-greatest game anymore, but it remains a popular title and a demanding benchmark. Intel HD 4600 improves performance by only eight frames-per-second, but those eight frames are important. The game tends to suffer from spurts of stuttering on HD 4000, and any effects (such as magic) can cause the framerate to dip below 20 FPS, which isn’t a pleasure to play. With Intel HD 4600, however, the game runs smoothly (with a few exceptions) and magical effects don’t turn the game into a slideshow. And remember: we tested at medium detail; going to low makes the game almost butter-smooth on the new IGP. We saw a strangely linear progression in this game, with each bump in graphics hardware increasing average FPS by ten. 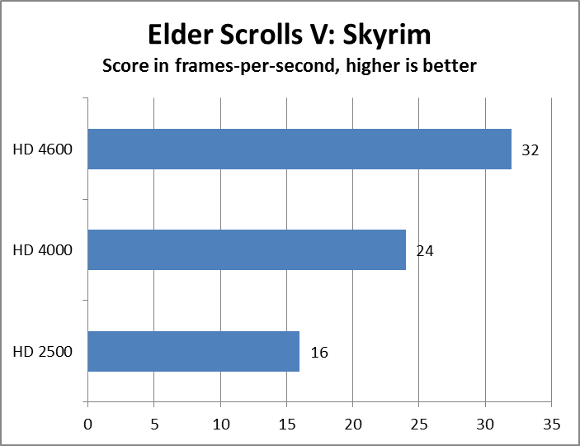 That translates to an almost 50 percent increase of in-game performance, and, as with Skyrim, the extra performance is enough to take the game from un-enjoyable at medium detail (on HD 4000) to just fine (on HD 4600). 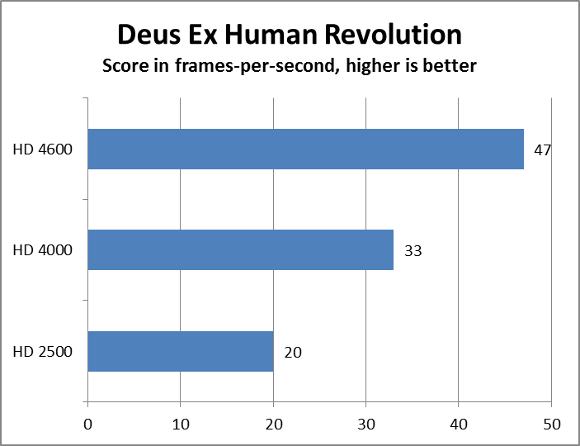 Unlike Skyrim and Battlefield 3, Deus Ex was playable and enjoyable on Intel HD 4000 at the settings we tested. 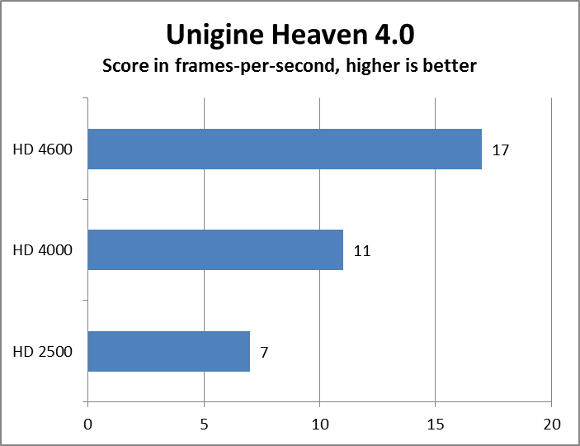 Intel HD 4600 increased performance only 42 percent relative to HD 4000, but because the game already ran well, this smaller relative improvement translates to fourteen extra frames per second. Deus Ex ran smoothly at all times, and there’s enough frame-rate headroom to increase a graphics detail. Intel HD 4600 is quicker, but what does that mean? The average performance increase among the three real-world games we tested was 39 percent, and adding in the synthetic tests boosts the gain to 53 percent. That’s about in line with what Intel promised, and more importantly, it was enough to make two games that weren’t enjoyable on HD 4000 a treat on HD 4600. Improvements don’t mean HD 4600 is an acceptable pick for gamers, however. Our tests were performed at 1366 x 768, which is common among inexpensive laptops, but increasingly rare among desktop PCs, Ultrabooks, and multimedia laptops. 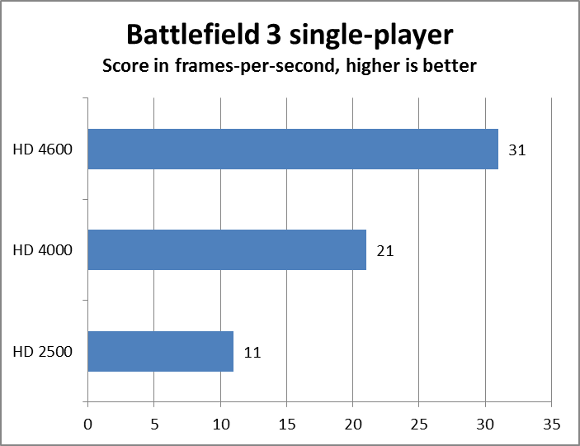 Gaming at 1080p will slice a huge chunk off these results and make many games unplayable once again. We also think it’s reasonable to believe graphics quality in AAA games will see a surge in 2014. Why? Next-gen consoles! With the Xbox One and PlayStation 4 out in winter of 2013, developers will be able to explore new limits. While HD 4600 is quicker, it probably won’t stand up well in PC ports of games built for next-gen consoles. Intel HD 4600 doesn’t change Intel HD’s position as graphics of last resort, but we’re happy to see the last resort become significantly more powerful. Consumers who can’t afford a discrete GPU can at least play 2011’s best games at reasonable detail, something which could not be said of Intel HD 4000.